Dockside Seafood & Fishing Center offers something for the entire family, if you are traveling to Virginia Beach and looking for something to do, a half day fishing trip or sunset dolphin watch cruise is the answer for you. We provide a memorable time for everyone, including families, fishing pros, and beginners. Our half-day open headboat fishing trips usually start in the early spring and continue through December each year. We also offer a sunset dolphin-watch cruise, trips will run Memorial Day thru Labor Day on Tuesday, Wednesday, Thursday and Sunday evenings only. In order to accommodate guests accurately, we ask you make reservations on all of our trips. For more information on available dates, call (757) 481-4545. We know all there is to know about boat maintenance and safety, and it shows. The U.S. Coast Guard regularly inspects the fleet of boats used by Dockside to ensure they meet all safety guidelines. The one stop nature of the Virginia Beach deep sea and family fishing trips is often the part that surprises travelers most. 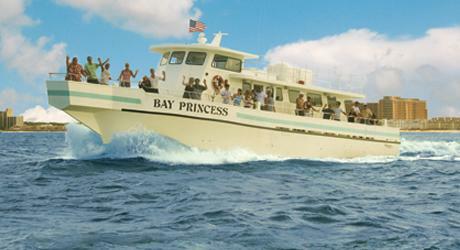 For more information on any of fishing trips and dolphin watching cruises, contact us today.